A new web browser, Firefox 1.0 was born on November 9, 2004 - Mozilla launched Firefox as part of an experiment in the Mozilla project. Its objective was to make the Mozilla browser available in a light version. And Boom! Both developers and users liked it so much it was more widely used than expected. Still growing strong with many supporters, Firefox holds a quarter of the browser market with over 330 million users in just five years later. 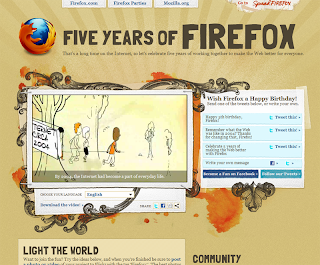 Check the video out in the link below to know about the Firefox story and how it began. A Mozilla website dedicated to spreading the word of Firefox - SpreadFirefox came up with a video about how it all began. You can download the video here. Alternatively, you can stream it over to your computer at the SpreadFirefox website here. Its worth taking a look at.